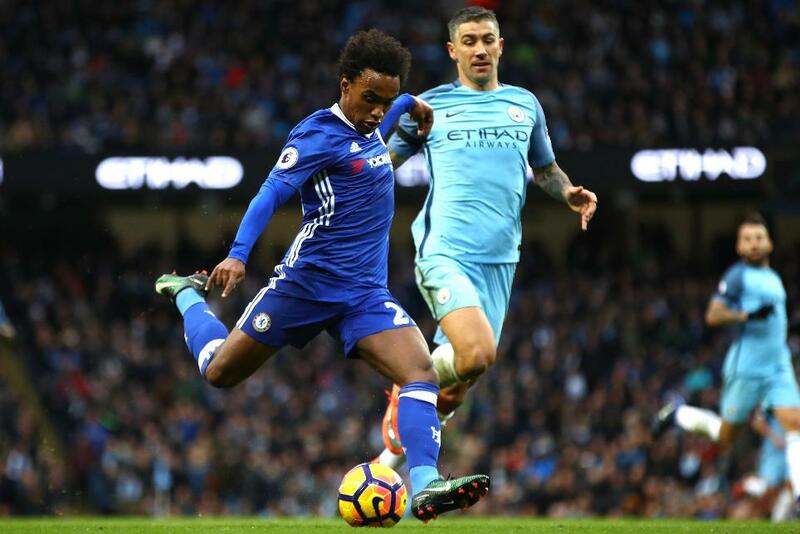 Chelsea rallied from a goal down to beat Manchester City and stretch their winning sequence to eight Premier League matches. Gary Cahill’s own goal gave City the lead but strikes from Diego Costa, Willian and Eden Hazard earned Antonio Conte’s side victory. Chelsea fell behind when Cahill’s attempted interception looped over Thibaut Courtois but, moments after Kevin De Bruyne hit the bar, the Blues levelled. Costa took his goal tally to 11 for the season with a turn and shot on the hour and 10 minutes later Willian produced a second, celebrating by holding aloft his armband honouring the victims of the Chapecoense air disaster. Hazard’s late breakaway goal decided matters before Sergio Aguero and Fernandinho were sent off.